Fly fishing Florida gulf waters for the first time introduced me to the Ladyfish: strictly carnivorous, feeding on small fish, including members of its own species. Ruthless – and they swallow their prey whole. What this means to your catch? They slam it! 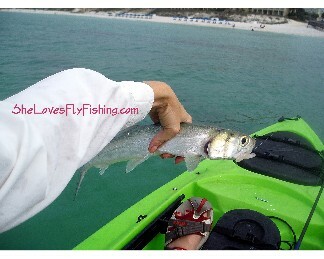 Run a bug that looks like a wooly-bugger with an eyeball through the darker water where the nutrients hang out and you’ll get your kayak pulled around when a Ladyfish hits. Ladyfish are fine scaled, soft fleshed, and oddly long. They’re shiny silver and don’t have teeth – bonus when you’re getting the hook out. Fun to catch but not great to eat. This was a business trip but thankfully, my hosts, Scott and Jon, were avid, strike that, rabid anglers. The fly rod wasn’t their exclusive choice but they did have one on board - a nice 5 weight, and enough flies to offer the finickiest fish a diverse menu. I like the way Scott and Jon think, “We’ll fish first thing in the morning and then we’ll spend a couple of hours on the business portion of this trip, and then back to fishing." Men with priorities firmly in order. I had no idea what to expect, (read: what do I wear?) but decided fully immersible and quick drying would be a wise choice. I walked across the street from my room to a SoWal Beach head and was greeted with big smiles, rigged rods – and sea kayaks! A first for me! New town, new fish, new fly fishing Florida gulf waters adventure. Shaping up to be a very good day! Launching the kayaks was the hardest part – steering them over the first few breaking waves to find smoother water without loosing your oar, your rod, or your camera securely sealed in a zip-lock bag, all the while balancing your good-morning beer. 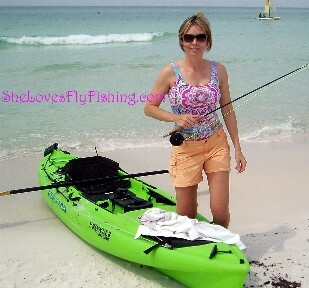 Casting from sea level, (literally) with an oar across your lap and a beer between your knees proved challenging at first – my double-hall needs work and I didn’t think I was getting enough line out when suddenly my rod bent in half like a folding yard stick. Fish on! This action kept up for the next couple of hours until I decided my arms were tired and that business should probably find it’s way on to my radar. But first we headed out into rougher seas and not a fish was to be found. Suddenly Jon began whistling and waving and directing me to a path past the sand bar. I began rowing furiously straight towards a pod of no less than 20 dolphin! Not dolphin-fish, but full on, Sea World caliber, jumping-diving dolphin! I paddled in fearlessly and I’m not sure why. You read stories of dolphin bonding with humans but these were feeding and had never met me before and could just have easily knocked my kayak over and pummeled me with their exuberance. I could see their eyeballs. They could see mine. This was an exhilarating moment and made me completely forget that the fish were fleeing instead of biting. My first Fly fishing Florida gulf waters experience will not be my last. Somebody better sell something so I can come back! How about Carp fly fishing?